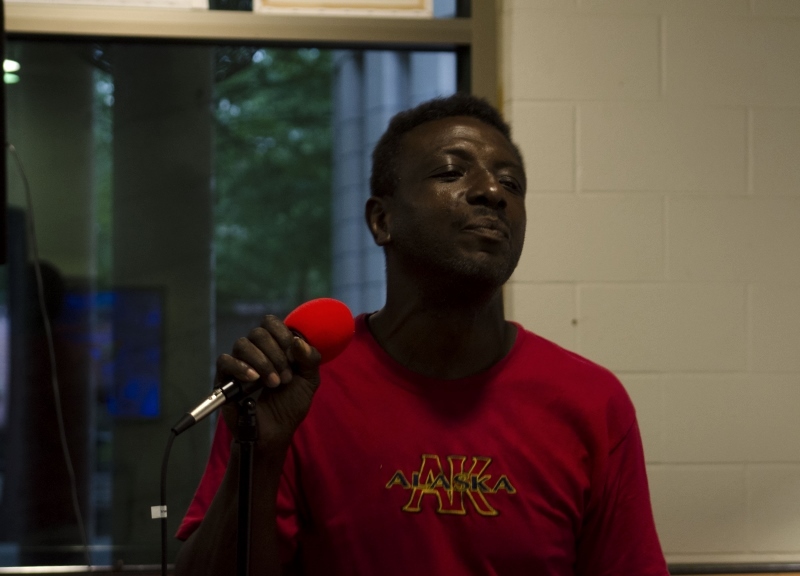 The Bridge Is Using Karaoke To Help Dallas’ Homeless Population Regain A Sense Of Purpose. It was the morning of Prince’s death, and Kamica King had just heard the news while she was preparing her morning coffee. As a music therapist at Dallas’ largest homeless recovery center, The Bridge, King knew that her planned lesson for the day would have to be scrapped. So she sat down at her computer and did some last-minute research. Later, as attendees to her day’s session began to trickle into The Bridge’s dining hall, Prince’s “Little Red Corvette” played under conversations that centered around death, loss and grieving. To many in the session, Prince’s music had been a staple in the soundtrack of their lives; to these people, it felt as if they had lost someone they’d known. But not all of them. Another guest wondered aloud if it was bad not to feel sad about Prince’s passing since he wasn’t someone she knew personally. Another guest spoke of her struggle with accepting a loved one’s failing health. From there, one gentleman spoke about the loss of his wife three weeks ago, compelling a second man to share how he had lost his own wife just 21 days prior and how much difficulty he faced in picking up the pieces with his children looking to him when he knew he could only do so much. That day, much like her other sessions, King and her guests listened to each other’s stories, sang together, reminisced and expressed their feelings. The result was a strong catharsis and reduction of self-reported stress through the exploration of personal feelings and the sharing of pain — all set to the backdrop of music in a therapeutic context. This is music therapy at work. * * * * *Effective as the field of music therapy is at reducing stress and helping patients in a number of other ways, Kamica King still saw a need for a greater variety of evening programs at The Bridge. 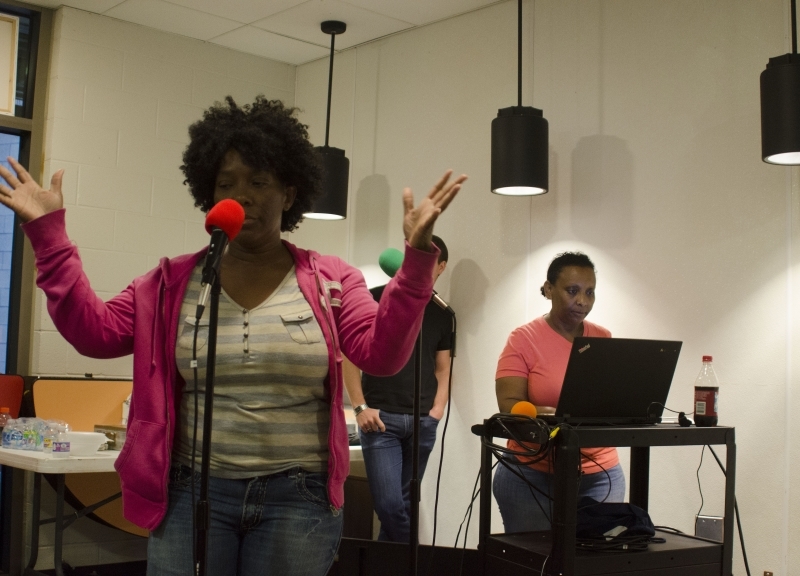 And so she added karaoke and a Bridge Beats initiative to The Bridge’s therapy program. The latter allows patients the opportunity to constructively express themselves while playing and practicing instruments provided by the organization. The former, well, is karaoke and exactly what it sounds like. 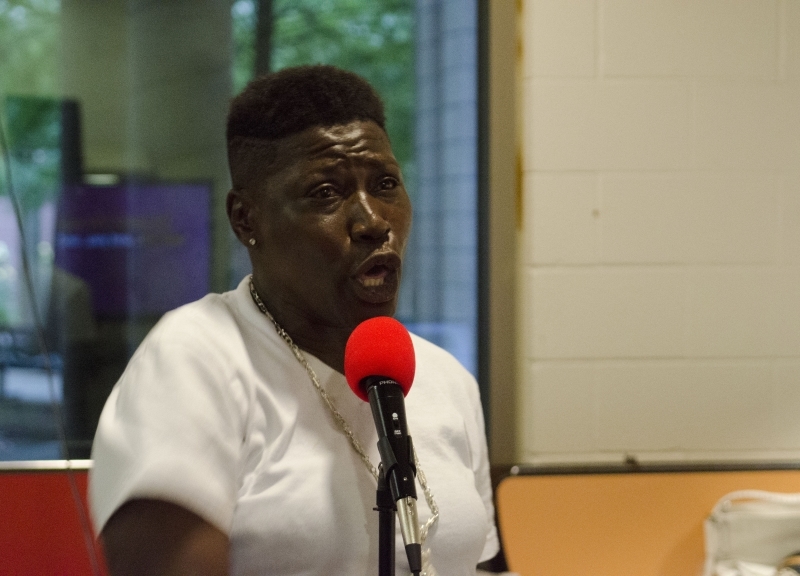 While these programs may simply seem like ways for the homeless to blow off some steam, they allow King to more effectively tailor the focus of her therapy sessions — whether it be mental/physical health, substance abuse or transitional housing needs — and connect those who attend to the appropriate department within The Bridge’s extensive services. • Standing on Dignity. // Is This Abandoned Naval Base Near Grand Prairie Where Dallas Should Dump Its Homeless? • Hired Guns. // Deep Ellum’s Trying To Curb Its Panhandling Problem With Off-Duty Officers. • Snapshot. // 5:23 p.m. On A Tuesday At The Bridge. • Homeward Bound. // Dallas Hates Homeless People, But The Cottages At Hickory Crossing Sure Don’t. 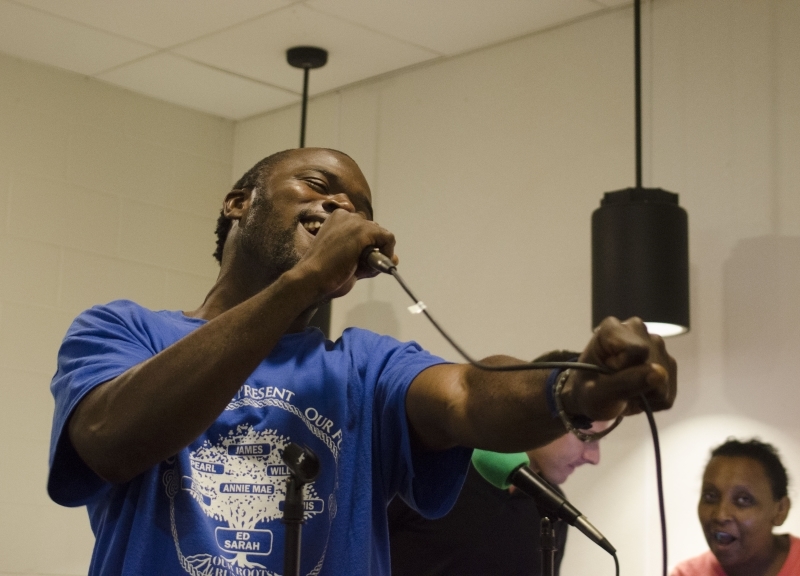 In some cases, events like King’s karaoke initiative provide even greater value. Other than simply helping these people meet basic needs like finding food, shelter and medication, Dr. Michael Zanders, an assistant professor at Texas Women’s University specializing in music therapy adds that programs like The Bridge’s karaoke nights give a sense of purpose to these people, as well as something to live for. “It allows for an outlet to express and to explore, but it also provides the comfort of someone going there and learning or playing an instrument,” he says. “It makes a huge difference in giving them purpose and meaning in life. It’s more than sometimes giving them food or drink or a place to stay; it’s the aspect of finding meaning that is innately you.” Evidence to support Zanders’ claims is well-reported. In 2008, Jennifer Ayers-Moore started the Nathaniel Anthony Ayers Foundation to help bring mental health issues to the forefront of the nation’s consciousness. Her brother Nathaniel was portrayed by Jamie Foxx in the film The Soloist, which details how a reporter discovered the former Juliard student homeless and playing music on the streets. Famously, music was a catalyst that helped Ayers slowly get out homelessness. A few years ago, Ayers’ sister Jennifer spoke about her brother at The Bridge’s annual fundraiser, which got the wheels spinning for The Bridge’s chief operating officer Sam Merten and his colleagues. 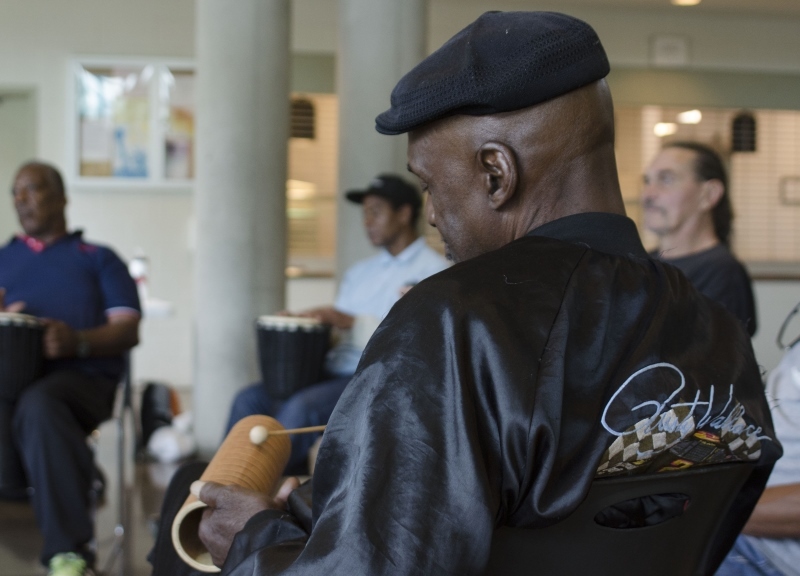 They decided music therapy programs might be beneficial to the population using their services as well, and looked to King, a graduate of SMU’s music therapy program to help make it happen. * * * * *According to The Bridge’s analysis, the organization has served 9,147 non-duplicated individuals and coordinated 364 housing placements last year. Initiatives like its music therapy programs are a big part of those services they’ve provided. The program takes in those who would otherwise sit outside, awaiting their turn through the admittance process at The Bridge or various shelters throughout the city, and boasts many positive effects on those that have participated. The shelters reigning three-time karaoke champion, 47-year-old Dallas native Kimmy Wyatt, is one of those patients. Wyatt says she’s been singing ever since she could talk. She was once an entrepreneur, and she even previously hosted her own internet radio show, “Now That’s What I’m Talking About.” But Wyatt fell on hard times after her mother passed in 2013. She lost both her show and her mother’s home. She then stayed with her son and his girlfriend for a while, but that was short-lived, forcing her back out onto the street until she arrived at The Bridge in September of 2015. Wyatt has since found transitional housing through The Bridge and will be moving into her own place later this month. Then she plans to pick up where she left off. Wyatt is just one of many touched by The Bridge and its karaoke program. 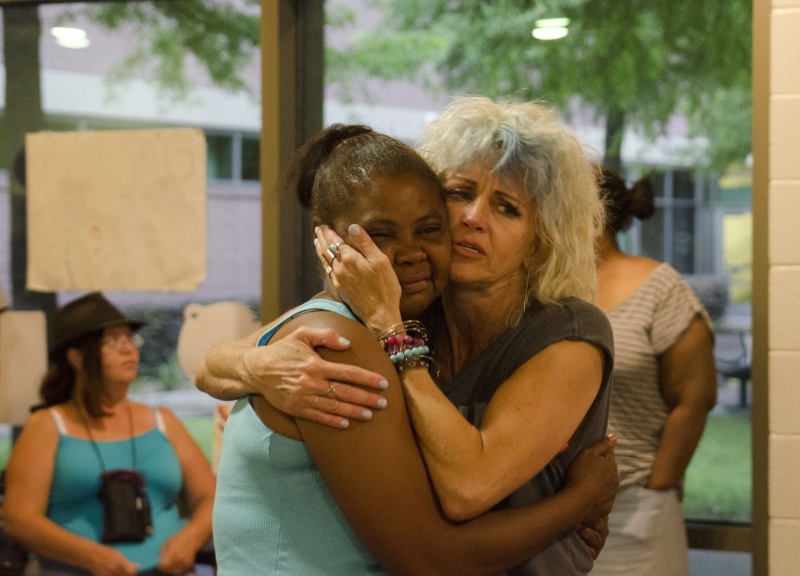 Between 800 and 1,000 people can potentially be seen every day at the large facility, with each of those falling into various stages of understanding why they are homeless and battling recovery. Kenneth is another patient of The Bridge’s music therapy program. He came to Dallas at 22 years old, working two jobs while providing for his immediate family. Originally from Arkansas, his bout with homelessness began in 1991 when he cracked a lower disc in his back while on the job at Tom Thumb and needed surgery. He has been on disability since 1994, but hasn’t rented his own apartment since 2007. Kenneth has been coming to The Bridge since 2008 and is now coping with some criminal decisions that led him to homelessness. Even after years on the street, Kenneth’s somehow maintained plenty of self-confidence. If there’s one thing karaoke has given Kenneth, it’s just that — hope. Additionally, there has been some support for the program from elsewhere in the community. King had forged a partnership with the AT&T Performing Arts Center, which has created an endowment to share a certain number of tickets to shows for King’s patients. * * * * *The rain began to come down on a cloudy afternoon just after 6:20 p.m. The line outside to get into karaoke began to grow. This is the place to be tonight. For a few moments a week, singing in tune becomes these people’ biggest worry. It’s a welcome change of pace. A few folks are noticeably nervous, but with the support of rhythmic claps and “C’mon girl!” and “Alright now!” shouts from the small crowd of 24 on hand, faint singing mumbles grow into confident voices relaying pain, happiness and appreciation. Kamica King’s approach to music therapy, dedicated to the recovery and reintegration of her patients back into society through karaoke, is an important one. In a time when tent cities are being evacuated, panhandling is on the rise and the topic of homelessness has moved squarely onto the City of Dallas’ front-burner, King’s efforts haven’t gone unnoticed. All photos by Sidney Johnson. Previous ArticleThings To Do On Tuesday, July 19.